NEW YORK—For the last seven years, The Dahesh Museum has proudly, if euphemistically, referred to itself as “a museum without walls.” It has been busying loaning exhibits from its collection of 19th century academic art, but the Dahesh itself held no exhibits of its own because it has had no gallery space. Instead it hosted regular lectures and movie nights in its SoHo gift shop, which is large for a gift shop but small for a lecture hall or movie theater. “We came through the door and thought, ‘Aha. Of course this is it,'” said Bob Madison, who has recently come on board with the Dahesh after over a decade of involvement with the museum. He handles marketing, communications, and logistics and has yet to be assigned a formal title. By then, the team had considered schools and churches, but none clicked quite like this location did. The 7,000-square feet, 1899 building used to be a private residence, featuring two French Louis XV marble fireplaces, an airy open plan with plenty of natural light, and a back patio of Italian stone suitable for small gatherings or outdoor dining. A sizable kitchen and bar is situated in the lower level, plus luxurious bathrooms throughout the building. All the walls are Venetian plaster or covered with chinoiserie wallpaper, lending a timeless feel to the rooms. “This space reflects our philosophy—we believe in beauty, in seeing beautiful art in a relaxed space,” said Madison. Though Madison said that a museum is “only tangentially a place to hang art” and chiefly a place to build community, New Yorkers will certainly benefit from a unhurried atmosphere in which to interact directly with academic works. Academic art—typified by the work of William Bouguereau, Jean-Léon Gérôme, and James Tissot—was made to display in patrons’ homes, not necessarily in vast, museum-like settings. So a townhouse on the Upper East Side makes a fitting home. Curators are working on three exhibitions for the new space, one of which will be selected to be the inaugural show, according to Madison. 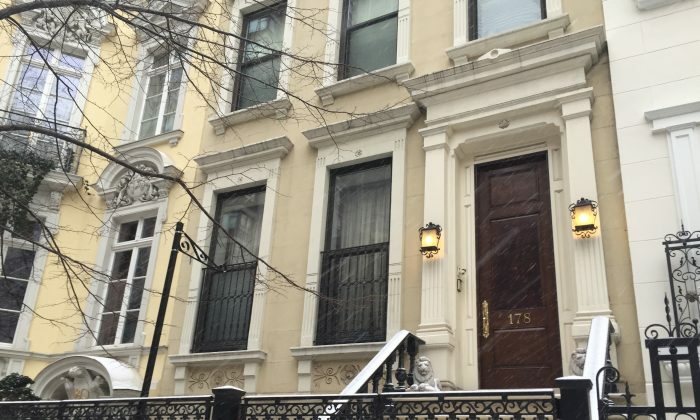 With conservative renovations (removing some walls, modifying bathrooms, and regulating humidity per museum regulations), 178 E. 64th St. will be ready to premiere as the new Dahesh sometime this year. So far it’s undecided whether the museum will retain its downtown location.